4) Enter the label that you want to appear to the user in the catalog, and click Save. This will create a list of monograph parts from which you can choose when you create a volume and copy. 5) Add a volume and copy. 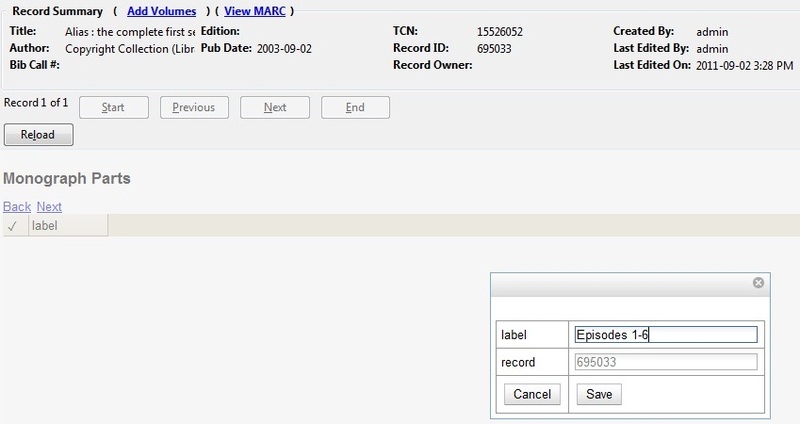 To add a volume and copy to your workstation library, click the Add Volumes link in the Record Summary at the top of the bibliographic record, or click Actions for this Record → Add Volumes. 6) The Unified Volume/Copy Creator opens. 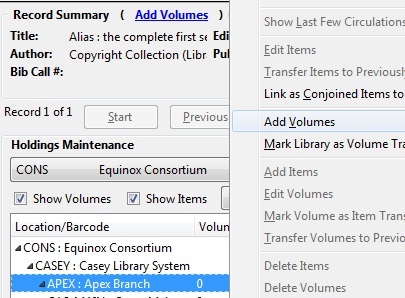 Enter the number of volumes that you want to add to the catalog and the volume description. 7) Enter the number of copies and barcode(s) of each item. 8) Select the part designation from the drop down menu adjacent to the barcode field. 9) Apply a template to the copies, or edit fields in the Copy Editor. 11) The Holdings Maintenance screen will refresh to demonstrate the addition of the volume, copy, and part. These fields also appear in the OPAC View.